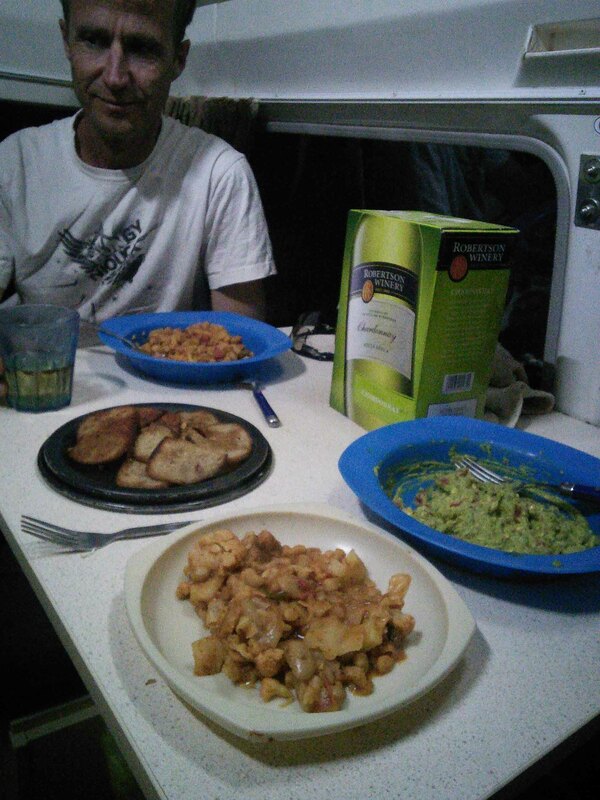 Last time I talked about vegan meals on the road, we were crossing from Malawi into Zambia. The more south we have gone in the last couple of months, the less we have gone out to eat and started cooking more and more in the car. There are a few reasons for this: firstly, there are better stocked supermarkets; secondly, there isn’t as much traditional foods to try, but rather a mix of different cuisines, mostly meat-based; and thirdly, the places we have been staying in lately have “game” on the menu, basically the animals we see running around wild end up on people’s plates. No thank you. 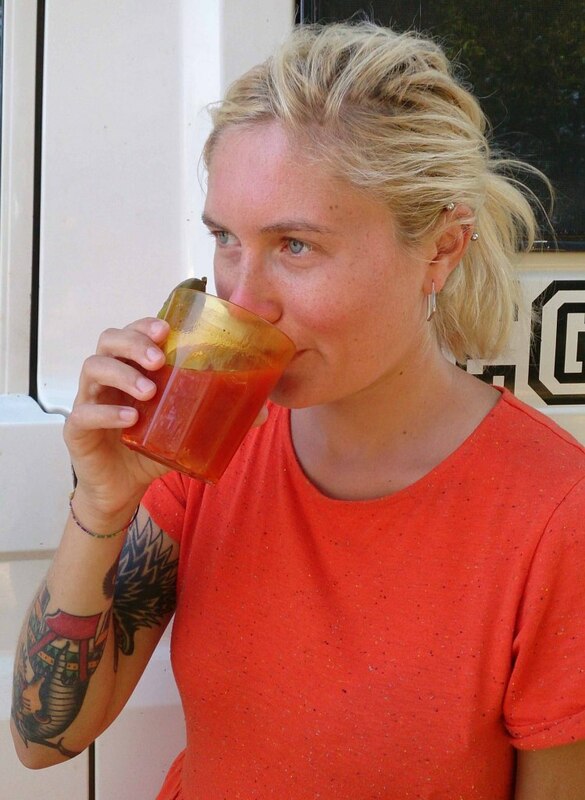 When we got to Lusaka, I thought I got rid of yet-another-illness of the stomach and we got some tomato juice and pickles and celebrated with a Bloody Mary. A day later I ended up going to the hospital (unrelated to the drink) and found out I have multiple infections in my digestive system and got put on yet another platter of pills, so Jonathan had to drink all the consecutive gin&tonics and Bloody Marys for a few weeks. While in Lusaka, we had gone out to eat twice (not counting chips). The first meal was at the mall, and we ate in an Indian fast-food place, which was alright and even good by mall standards. The second time we ate at a backpacker place where we had gone to check out the wifi and the bar. Jonathan ordered a veggie burger, while I opted for the beans and rice; the food was quite yummy despite taking about an hour to make and driving us into hunger-induced bad tempers. I found the “veggie burger” option in a few places actually, which is a nice addition to the usually predictable chips. 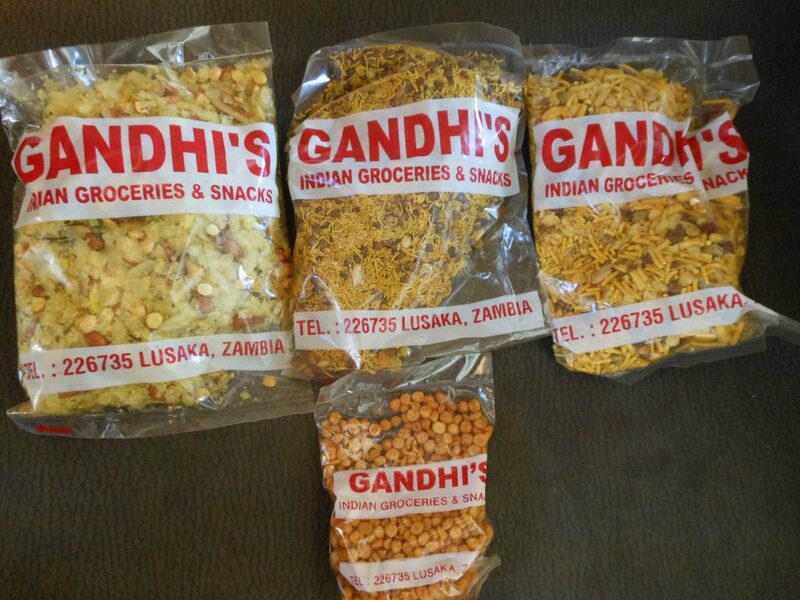 Before leaving Lusaka, we found a little Indian shop that sells Indian snacks, so of course we had to buy some. The most bizarre looking one ended up being the insanely oily but addictive one, whereas the others left us mostly indifferent. They are good to munch on before lunch, but they are so oily that everything in the front of the car gets oily as well. After Zambia we headed to Zimbabwe, and in Harare went out to eat the first night – to the Holiday Inn restaurant. They had a buffet which surprisingly had quite a few (accidentally) vegan options. On top of that, they apologized tremendously that they didn’t have more for us, and only charged us the price of one meal. Incredible? We had some salads and then some sadza (maize meal) for the first time on the trip, and I wasn’t impressed. I know it is a staple in many countries but it was just a bit bland and reminded me of baby food – or kindergarden food. 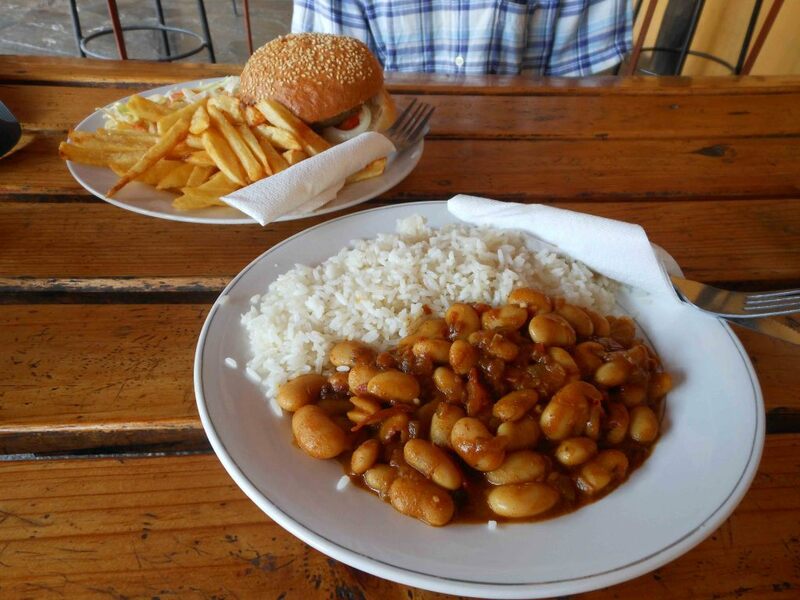 The other amazing thing about Harare of course was that we visited V Delights – the Vegan Friendly Products (read interview here) restaurant, which is completely vegan. 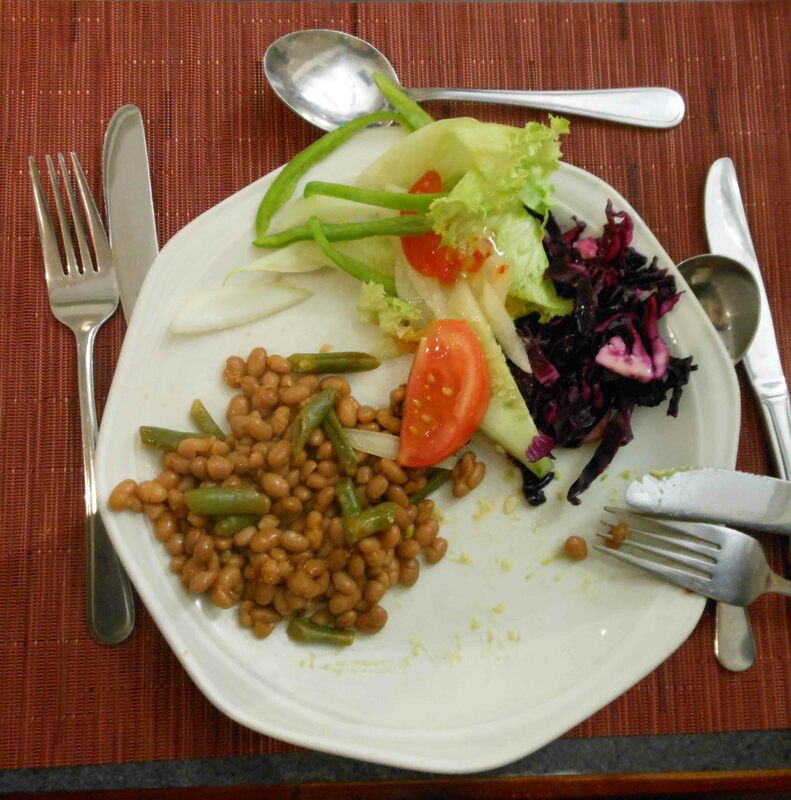 There are many items on the menu, all catered for different kinds of people, some are vegan African dishes, some more Western ones, then there are a whole lot more “healthy” options, and then again more options suited for new vegans or transitioning vegans. The pies and the cookies we had in V Delights were just out of the world. If you are ever in Harare, you have to stop by there! 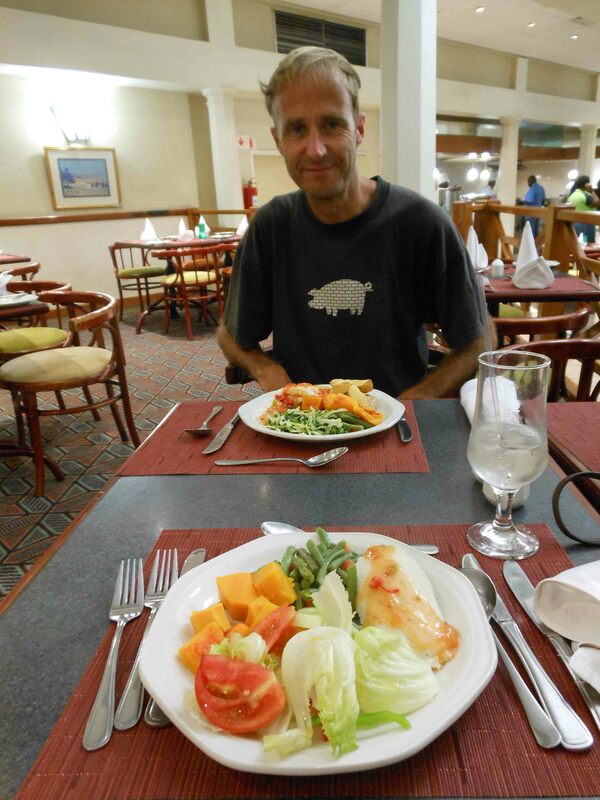 While staying in Victoria Falls, we went to one restaurant twice – and had some tapas. There were a few vegan options (I had maize again, this time with some spinach things inside) but the second time we came the food quality had dropped significantly. Their gazpacho was too salty, their toasted bread was soggy, but overall it wasn’t so bad I guess. The last place I want to talk about (before mentioning that we are going to check out the Ethiopian restaurant here in Windhoek!) was called La Marmite in Windhoek. We accidentally stumbled upon the place in the “Zoo” park in the center, thinking we would only have drinks but then saw the menu and decided to try out the vegan options. The food was pretty good, and the dishes are supposedly variations on Western African cuisine. 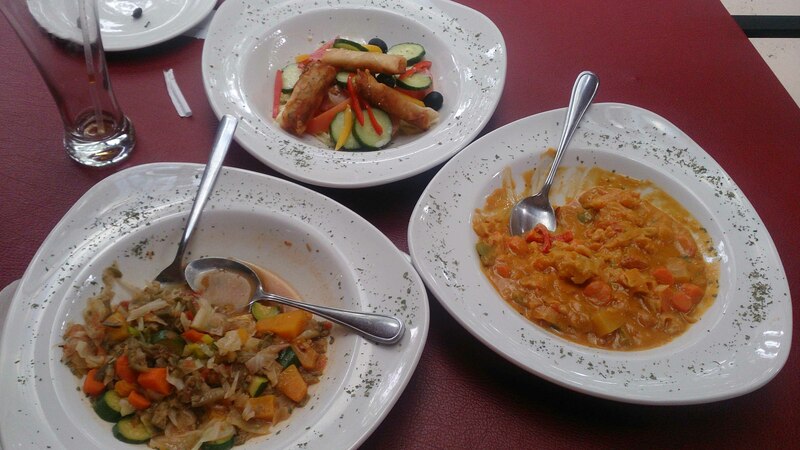 I had a stew with okra, Jonathan had another stew with groundnut sauce, and we also shared spring rolls and salad. Windhoek has a lot of places to eat and drink, and I am sure traveling vegans would have no problem finding food here. The rest of Namibia – not so much. 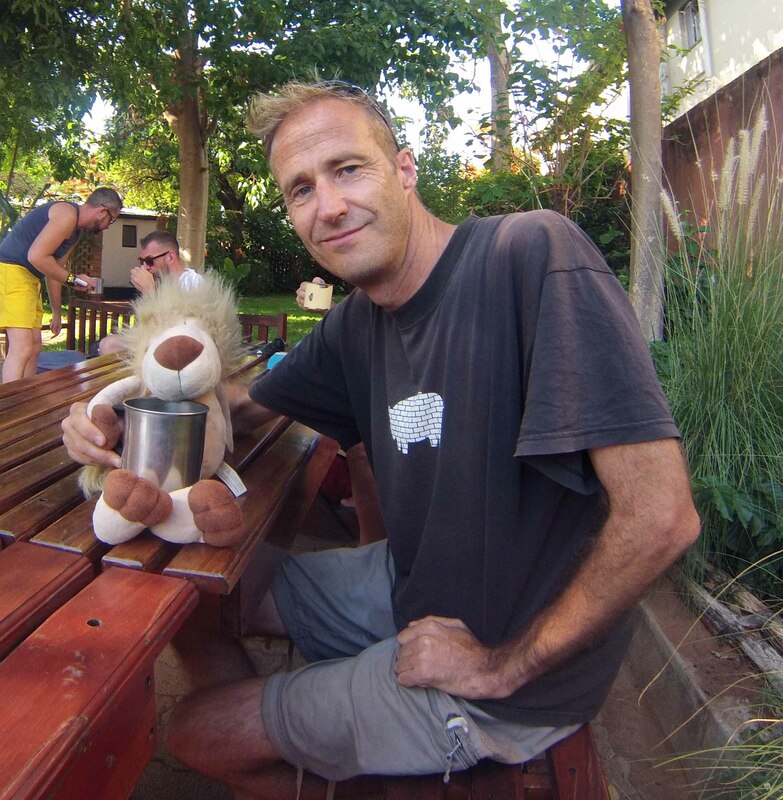 In Botswana and Namibia a lot of expensive lodges (where sometimes we end up staying because they do cheap-ish camping) the menus pride themselves on having extravagant game steaks – gemsbok, springbok, kudu, oryx, and so on. The first place we stayed in Namibia, in Gobabis, was one of those places. I think I already mentioned how awful the service was in a previous post, but let me add that the menu was incredibly un-vegan, and when we tried to get something altered, it came as is, so I ordered potato wedges, asked for “no mayo” and they still brought mayo. Trying to ask for some olive oil instead of creamy dressing turned into another ordeal. This is sadly the way it is in most places where expensive guests are catered for. We had another buffet experience, this time in the Etosha Park, and I ended up eating sad salad and boiled rice with mustard. Only after we paid we were told “oh yes there is a separate thing for vegetarians” like the waiter couldn’t have told us earlier or figured something was wrong as he saw a pile of sad rice with nothing on it on my plate. Oh well – I was just getting my cold then and I was already in no mood for food anyway. As for us cooking our own meals, we have come up with some real highlights lately. We have been buying leeks because I personally love them and Jonathan makes a really nice potato leek soup. Sadly one day I decided to make it, with a special twist (pickles) but I didn’t manage to achieve the taste I wanted, which was a shame. 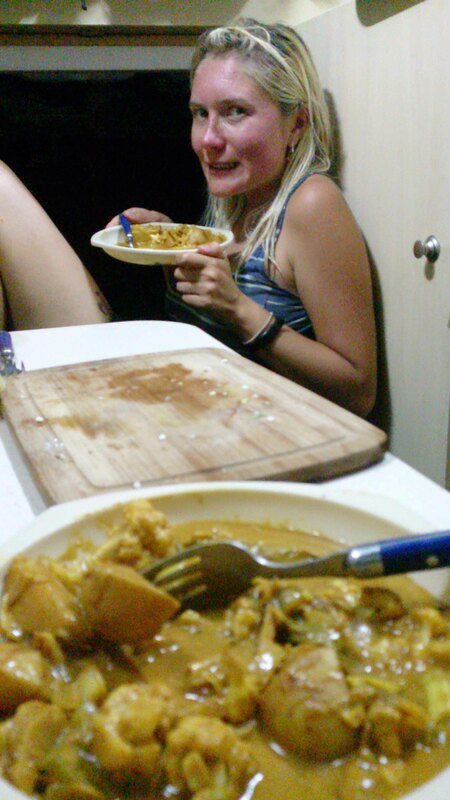 Otherwise we’ve had a lot of curries and chillies, there was a particular evening meal I remember well. We bought a box of white wine, which was quite fancy (by our standards) and I wanted to make a few dishes. I made a stew / chilli with cabbage, cauliflower, potato, beans and so on. I also made guacamole (the avocados are good again) and Jonathan toasted some brown German bread as we had no tortilla chips to go with the guac. It was truly magical, the whole combination! And then just the other night Jonathan made one of his coconut curries which was supposed to be very good for my sinuses, as I was really ill at this point. There was chilli sauce and ginger, and many other ingredients, and they blended so well together that we had to restrain ourselves to leave some for the next day’s lunch. A word about chakalaka: what is it? where does it come from? It is a tasty canned mixture of tomato gooeyness with some veggies and curry flavoring – and quite spicy too! It has an unforgettable taste and smell, I mean I recognized somebody else having it in our campsite yesterday. It can be put on bread, it can be used in stews and sauces and curries. We mostly put it on bread, but sometimes we also use it in sauces. 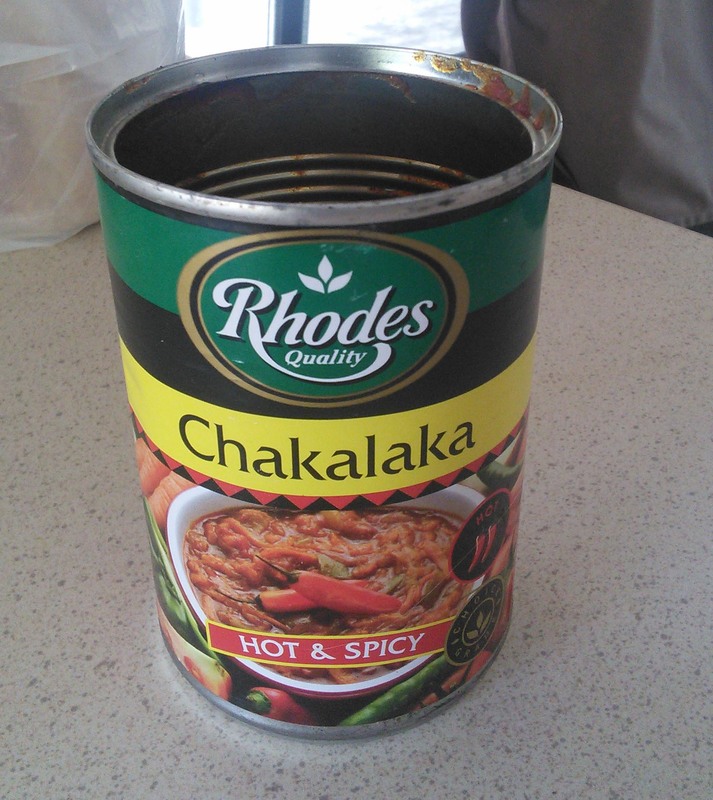 They even make chakalaka packet soup! 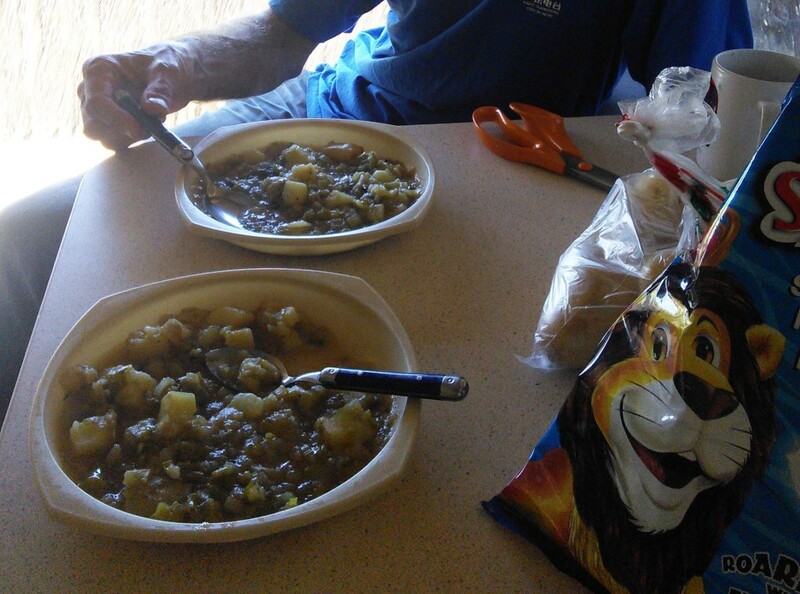 Which we had once as well, it didn’t look like much but it was spicy and it was better than tomato packet soup. 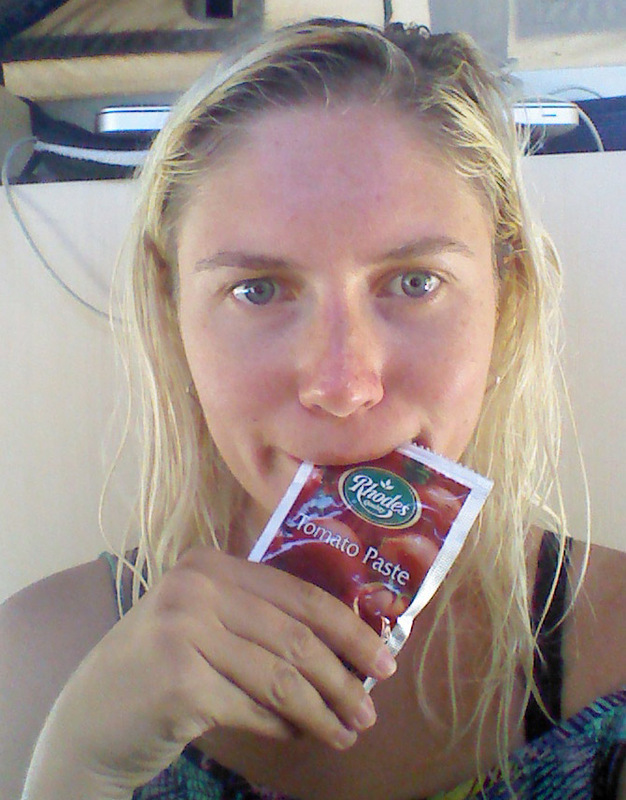 We’ve had a lot of snacks, most of them quite unhealthy, so instead I am adding a picture of me snacking on tomato paste, something I do quite often. We are done with our adventure for now, excited to try out the Ethiopian restaurant in Windhoek(we really miss Ethiopian food) and overall it hasn’t been hard being vegan on the trip at all! I do realize we have the option of cooking for ourselves, which a lot of times saved us, but in reality everywhere will have at least rice or maize and some vegetables. However, Ethiopian food has been the most memorable by far on the whole trip, both in terms of availability and quality of taste! A few months ago I came across a peculiar website – “Vegan Friendly Products” in Harare. Immediately I emailed the contact provided on the site, and got a reply from Louisa Ndlovu. She explained to me that what they have is a multiple parts juncture: part wellness centre and lifestyle change coaching, part health shop, part restaurant (V Delights) and an organic garden. 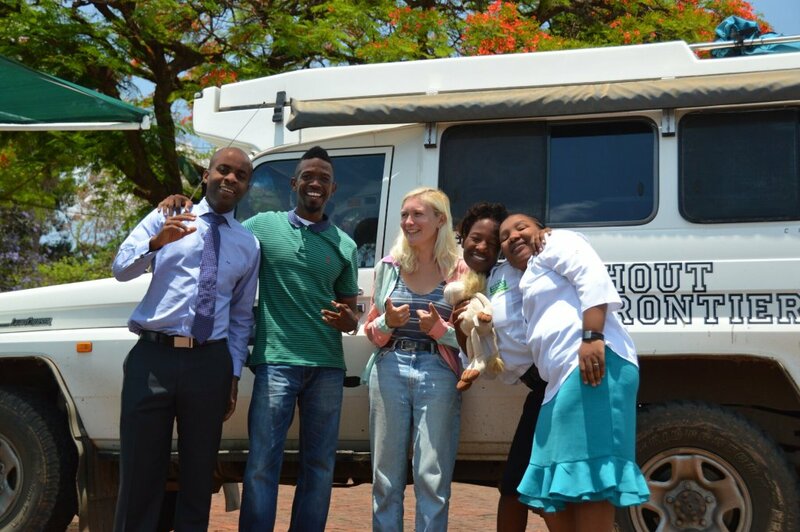 We were very intrigued and decided to change our plans to include a stop in Harare to meet up with Louisa and her family, and to interview our next vegans: in Zimbabwe! The compound they have is beautiful: there is a large garden with shade and a few tables, and in the back they have some vegetables growing, such as tomatoes, cabbage, spinach, beets, and so on. They have a small shop with all vegan products, such as flour, nuts and seeds, gravy powder, cereals, dried vegetables, a few oils, and many others. They also have a restaurant with various menus, and a health clinic in the back as well. Their clients include many of Harare’s high profile people who want to change their life around with a plant-based diet, which is the primary drive for being vegan for Louisa’s family. Vegan Friendly Products is a relatively new business, but it already has a lot of clients and the people involved seem very passionate about their work. We were received with lovely pies, smoothie and tea (the tea was so good we ended up buying a whole packet for the car), and we chatted to Louisa and her sister Sicelesile about them becoming vegan, their passion for healthy living, and even an idea to have the world’s first vegan police force. We also met another vegan, Morathi Howie, who is originally from North Carolina in America, so of course we had to have a quick interview with him as well. Katana: How long have you been vegan? Sicelesile: This is my ninth year that I’ve been vegetarian. Initially I became a vegetarian, then I became vegan, I went back to vegetarianism, now I am vegan. Louisa: As for me, I became vegetarian in 2008, and by the end of 2011 started being vegan, and by the end of 2011 my whole family was vegan. Katana: You said you have three children? Louisa: I’ve got three children. A seven year old, three year old and two year old. The two year old was already born when we were vegan, the three year old was semi-vegetarian then vegan, and the first one we transitioned between meat and vegetarianism. Sicelesile: She used to eat KFC! Louisa: “You are the one who taught me meat!” but it happens with kids. My husband is vegan also. Katana: When did you start the business? Louisa: We started this business in June this year, that’s when we moved into this place. Prior to that we had a shop, moving around, like a moving shop in our car with the healthy food stuff. Then we decided, as a family, me, my husband and my sister, to grow out this passion into something we believed could serve the world. We realized that many people are suffering from lesser diseases that come from appetite. If you control appetite, control the taste buds, and educate, at the end of it all we will be in a position to deal with certain things that even the medical field is trying to deal with but by giving people drugs. Drugs to just suppress symptoms but leave someone with another bad condition. So you’re talking about blood pressure, cancers, diabetes, weight loss, obesity, asthma. Sicelesile: You name them! I refuse to call them diseases. Louisa: They are lifestyle conditions. Sicelesile: They come from negligence of the laws of nature. What we do here is to reverse that process. We don’t treat symptoms, like my sister has already said, but we do root-cause analysis, look at the whole lifestyle, including not just food but exercise, if you have clean air around you, if you drink the correct types of drinks, if you rest enough. It’s a holistic approach to treating diseases. Katana: Sorry to backtrack a little, how did both of you decide to become vegetarian and vegan? Louisa: For me, first of all, my husband was obese as I said before, and when he did his lifestyle change, because I am the one who spends time in the kitchen cooking, I was supposed to cook three different meals, one for him, one for the kids, and one for myself, because we all had different needs. In the process I developed a problem, I couldn’t conceive at that time. And as I interacted with many health reformats, I was also educated to believe that if I change my lifestyle, I would get rid of those problems. One day I said I am going to go this route, I am not going to cook separate meals for anyone, I am going to eat what he eats and the kids will eat what he eats. It will save me time and everything else, and if it works, then it works. And apparently for me it worked, I am a mother of three, I would have just been a mother of one then, if it wasn’t for my lifestyle change. Doctors told me my ovaries were destroyed and I couldn’t conceive, but once I did my lifestyle change, it worked for me. My husband was obese, you saw him, now he is skinny. Because this thing worked for us as a family, we stayed with my sister’s choice. Initially when she came from the UK, we didn’t support this thing. We thought she was weird. Louisa: What happened was that we thought we had one common ground. We understand how we should eat and how we should live. Why not come up with a business model that will help serve the world. Since it has worked for all of us, then we decided to take it to greater heights. For me and my sister, we already abandoned the former employment, so we are full-time here. Our passion is here, our life is here. My sister used to work for a big company, but she left. I used to be the head of IT, and I left. And it’s working out for us, many people come through here, through the wellness center, we have clients which give us repeat business, and people give us good testimonies. Sicelesile: As for me, I became vegetarian when I was in England. I’ve always been small-framed but I’ve always had a problem with a big belly and I had terrible skin. I had acne, and I used to spend so much money on make-up. When I decided to become healthy, I was a McDonalds and KFC addict. I had a loyalty card for Nandos! I loved my meat and I worshiped it. But I realized that the direction my life was going was not good, and I started learning more about healthy living. Growing up I always learned about healthy principles, but I thought “That’s just for the religious people, not me.” At this point in my life I decided to try it to see if it worked. And when I did, my life changed. I used to hit the gym every morning and evening and run 3-6 miles a day, but it wasn’t really registering in my belly. But when I became vegetarian, things changed, and when I became vegan, it became even better. Now I don’t even wear any make-up, and I don’t spend so much money on it, instead it goes to the nuts and fruits and vegetables that I enjoy eating. Being here for me is like a dream come true. I love being a software engineer, but this is my passion. This is one of our fundamental beliefs, that we treat our body as a temple, so when we are here, it is first a health ministry, only then a business. We enjoy seeing every single person that walks through this gate, showing them the love and seeing them recover. This is priceless, it’s a hobby, it’s a passion, it’s a calling for us. Jonathan: Does Zimbabwe produce most of its own food? Louisa: It’s kind of small-scale, so it’s not sufficient for everyone’s needs. We basically depend mainly on South African products, for example take sunflower seeds. We grow them locally, but because of the economical situation, we don’t have the equipment to process them. What happens is we farm the seeds here locally, then they send it over to that side, then we buy them from that side, because we cannot process them on our own. Things like sesame seed, now some local farmers are doing those for us, so we can get those locally, the moon bean, they are growing it locally, but it is probably an issue of educating people, what they need to farm. People have the mindset to farm more profitable crops, because it will give the farmers more money, but now as we educate many of the people who are visiting our center, they are willing to partner with us in farming what we think is the right things to grow. Jonathan: Growing things that people can eat straight away. What happens in Europe and America is the land is used to grow huge amounts of corn, only to be fed to farm animals, instead of growing directly food for consumption. Katana: What would you hope for in the future for the people of Zimbabwe in terms of what they eat? Louisa: What I realize is that the world has become so fast these days. People like chasing money, but one thing that can bring down a business man is sickness. Once you’re sick, you can’t continue to chase that money. So because of that love for money, people are willing to do a lifestyle change, to reform and to see their enterprises grow. Like I said before, we don’t have ordinary people coming here, so because we have those influential people here, one of the guys was even saying he would invite us to their spheres of influence. Once you get through the “big bodies”, the message will spread on a larger scale. One of the projects we are looking at currently, although it is still in its infancy, is driver fatigue. Because we were both in IT, we can partner with other people in IT and look into reducing road carnage. According to Zim statistics, 85% of road carnage is linked to driver fatigue and human error. We are saying, as vegan friendly, we know certain foods trigger tiredness, fatigue, dizziness, and all those kinds of things. We are coming in with the mindset that if a driver follows our dietary requirements, they can be free from fatigue. The companies of those trucks transporting between Zimbabwe and South Africa would rather have their drivers on a vegan diet than be involved in putting in special gadgets that get triggered by driver’s fatigue and get sent to the central system, and it becomes a criminal offense. We are hoping to get a breakthrough. Sicelesile: The part she left out is that we want to be the ones supplying those meals to the drivers, so that we can deliver them at strategic points, a meal that’s full of vitality and that will actually keep you awake. Jonathan: That is an argument for going vegan I haven’t heard before. Sicelesile: The first thing we are hoping is to start with the police vehicles, suppose like this December. Let them be on the program, have the drivers eating our meals. They could have two samples, the people on the program, and people that are not, and evaluate afterwards. Jonathan: So we have the world’s first vegan police force! Louisa: Hopefully! We believe in this, and we’ve put so much effort into it. Sicelesile: It should change the nation. Katana: What about you, Morathi, how long have you been vegan? Morathi: I’ve been vegan since I was 20 years old, about 17 years. I turned 37 on the 22nd of October. Katana: How did you become vegan? Morathi: I became vegan when I went off to college in North Carolina Central University. It was the path that chose me. Some friends grabbed me up and they said “Hey, did you know that you can eat a better way, did you know that this is not good for you?” Of course, I denied it at first, and then the truth hits you once they teach you about it, so then I learned, as I was with my friends, how to transition into being a vegan. 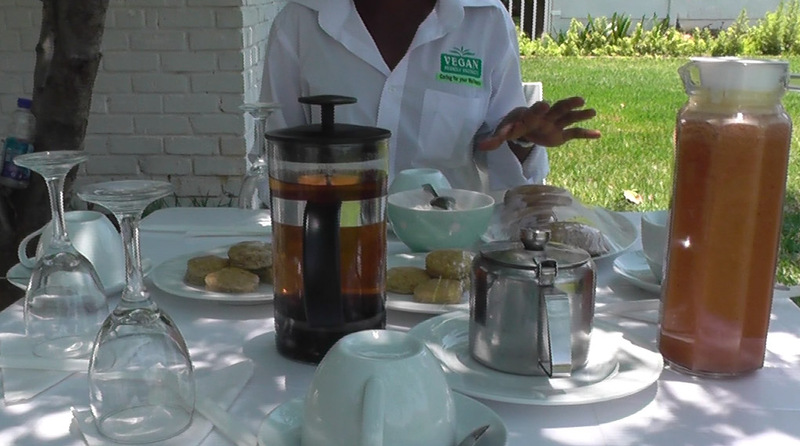 Katana: How do you find being vegan in Harare? Morathi: It’s excellent. Basically all the food is organic, mostly. It’s better than any food that you can get outside or any other country that I’ve experienced so far. I love it, and they (pointing to Louisa) made it so much easier, as they opened up a new restaurant (V Delights). I think that once you put it in your mind that you don’t really need the food supplements, you can do the fruits, everything that comes out of the ground, and you can lead a very good vegan life here. Katana: And have you travelled a lot around other African countries? Morathi: Yes, I’ve been to Zambia, I’ve been to Ethiopia, South Africa, Egypt, a little bit of Dubai, and of course Zimbabwe. Katana: How do you think Zimbabwe compares in terms of vegan eating to other countries in your experience? Morathi: If Zimbabwe could get the fresh squeezed juices like Egypt has, then they’re going to be amazing, but we are going to help Zimbabwe to get to it. But especially the living here, it’s the most peaceful country that I’ve been in my whole entire life. Very very peaceful people: people make the environment and this environment is heaven on earth, I love it. It has been quite an eventful few days since we last updated. 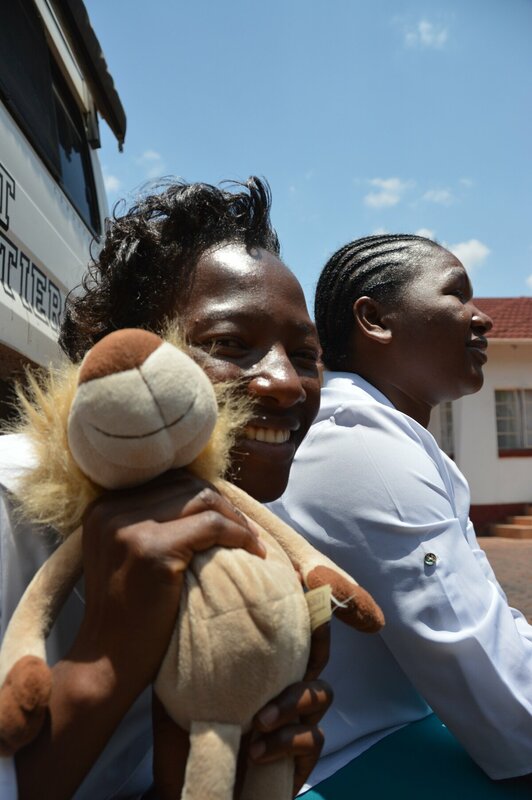 It starts with a hospital in Lusaka and ends in a hospital in Victoria Falls. Both times it has been me, the unlucky vegan warrior stumbling across the African plains.. no, not quite so dramatic. One of the main reasons we remained in Lusaka for a few nights was actually because I was sick and we needed to see a doctor. I won’t go into details, because they are not very pleasant. But in Lusaka we found a nice private clinic, I saw a doctor, then did a bunch of lab tests, after that we waited for a very long time, but finally the results came in: no scary parasites, no weird diseases, but nasty fungal and bacterial infection of the stomach, intestines and who knows what else. I was instructed to take 8 pills every day, and that is not counting Doxycycline for malaria! My body was feeling rough, having been ill for a few weeks and having to pollute it with more medication. 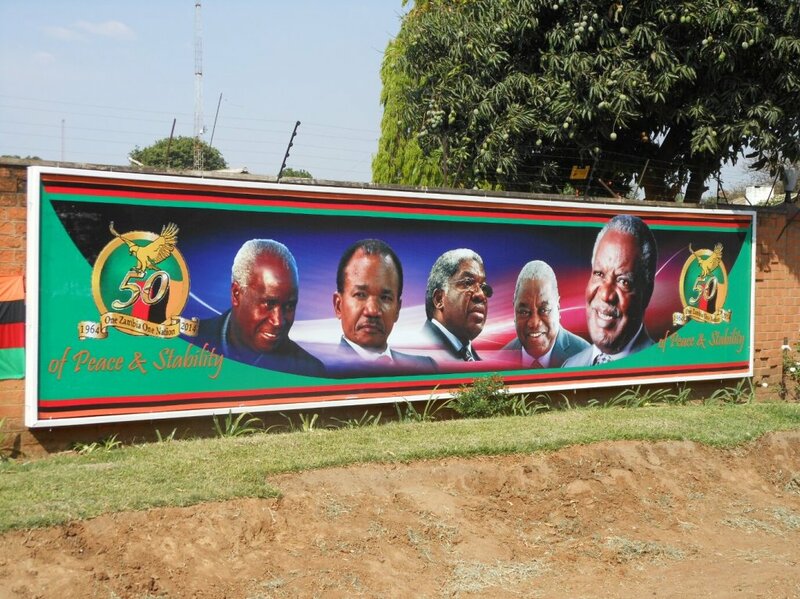 On the bright side however, we got to stay for Zambia’s 50th anniversary of independence celebrations, in the capital city! There was a parade I believe, but we missed it. We walked around the city, the streets were quiet without traffic on some of the major roads, and people wearing clothes made out of Zambian flags, the country’s national colors, and some men wore national football jerseys, some specifically made for the 50th anniversary. Lusaka’s center is small compared to other capital cities, but it is lusciously green and didn’t seem too dirty. On our first night in the city, we went out for a beer (that was before the clinic visit and 8 pills) and on the way back encountered an entourage of scantily-clad women hanging out on the corner of a posh street with embassies. We read about the Zambian night-walkers in this part of town, so we didn’t really want to hang around and hurried home. On the way back I stumbled upon uneven ground and fell on my knees and palms, with deep scrapes on the latter. I am unlucky! 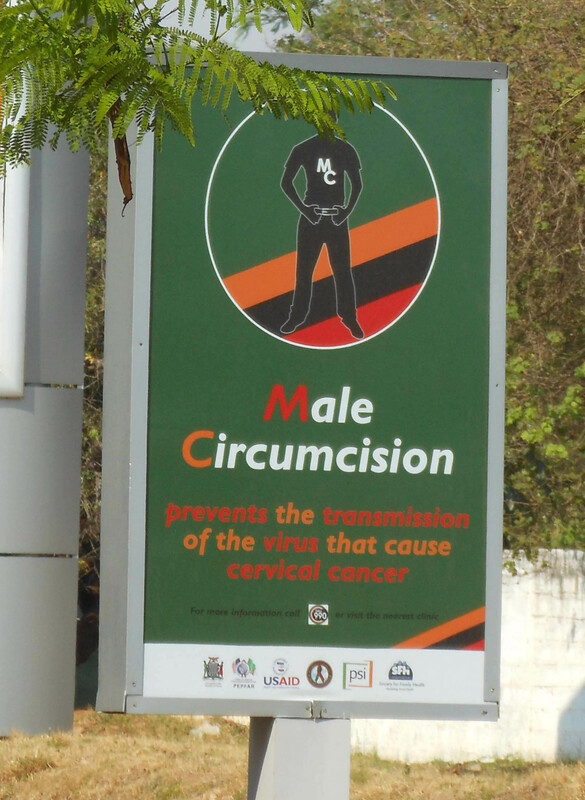 What I also noticed in Lusaka was the amount of foreigners, or expats, hanging out in the center and the shopping mall. Probably comparable to Nairobi, or even more. We also managed to find the Indian corner, as we have done before in African capitals, and bought Indian snacks: some were bland, some were good, and some just downright addictive and greasy. After a few days in the capital we headed for Lake Kariba. We decided to stay one night somewhere on the beach, and the next day continue to the Zimbabwe border. The place we found on the lake had a campsite right on the beach and was completely overrun with people! We haven’t seen so many people, especially not foreigners, anywhere in Africa to be honest. There were a lot of Zambian families, either on the lake as a day trip, or staying in cottages for a few nights, and even a few camping in tents. The camping spot was beautiful, with the full view of the manmade lake, the islands, the red soil underneath the water (colored my hair a bit after a swim), but the facilities were unpleasant, and herds of goats came foraging in the trash in the morning. Crossing into Zimbabwe we had to drive on the dam from one side of the lake onto the other. This border post was very strange, it was merely a big tent with a long table and three or four guys sweating inside in the semi-darkness. The strangest thing perhaps was a little short stout man who was half-murmuring to himself (or to us) as we passed him on our way to the tent, but we just thought he was one of those money changers or whoever else hangs out around borders in these parts. The immigration officer sent us first outside behind the tent – and who do we meet, but the same stout man disapprovingly shaking his head at us. It turned out he was the health check person (they have those at some borders too, mostly checking yellow fever certificates or temperature for ebola). He was so upset we didn’t follow what he said to us as we passed – apparently he told us to go with him! He accepted no apologies, but made us stand there reciting everything we know about ebola, like two dirty schoolchildren who have just misbehaved and are now made to stand in front of the class and recite the rules. What a peculiar man, and even more peculiar was that he made us ink our thumbs and only then sent us on our way. The inky thumbs stayed with us all day. 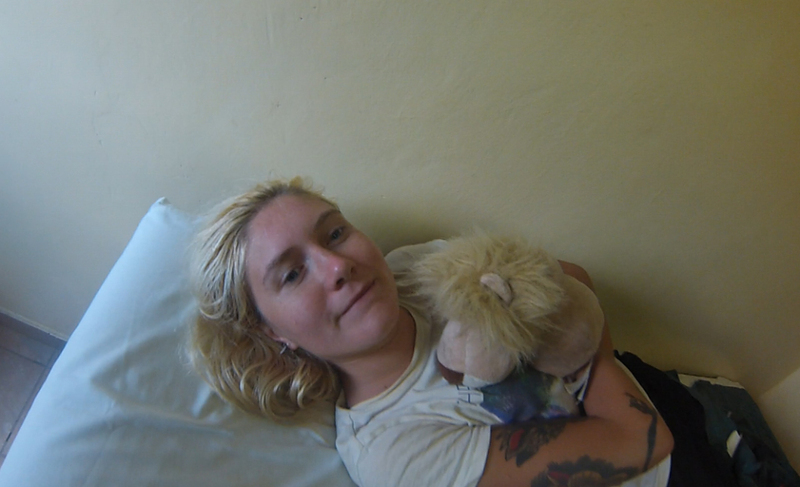 We knew we weren’t going all the way to Harare in one day, so we tried to stop at Karoi, but the only accommodation they had was a run-down $80 hotel. We pressed on to Chinhoyi, but just outside the city we saw a Chinhoyi Caves National Park with a pretty decent cheap campsite. In the morning we set out to Harare, got there pretty quickly and checked in at the newly built N1 hotel – we needed wifi for several things and it was nice to relax in a real room for the night. After getting settled in, we walked around the city for a few hours. It was really quite magnificent: long wide straight roads, the center divided into squares, sidewalks, mostly cleanliness, and the park was lovely as well. The buildings were glistening in the sharp afternoon sun, clean and tall, and some with very unique architecture as well. Definitely unlike any African city we’ve come across so far! 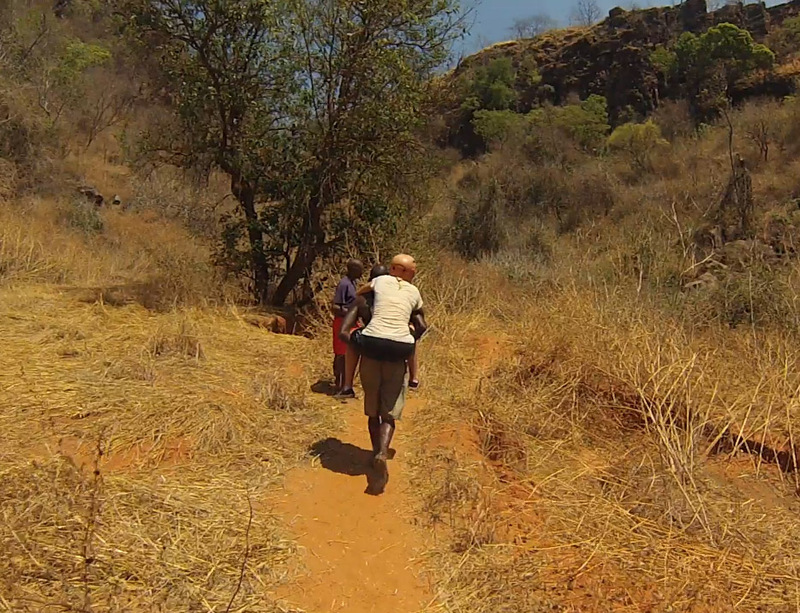 The next day in Harare was somewhat of a let-downer, and then a steep slope up. We had set up a meeting with the people behind Vegan Friendly Products and V Delights. We were very early, so we drove by one of the campsites in the city, thinking we might stay the extra night and camp there instead of the expensive hotel. As we rolled up to the campsite, and parked just outside the gates, we got approached by three guys, two in nondescript uniforms, and one in normal clothes, claiming that we ran a red light and would have to go to the police, have our car confiscated, and so on and so forth. Looking at it now, they were just regular con artists, but quite intimidating, and we were almost running late for our meeting, so what could we do but give them some money and drive away? Afterwards we met the lovely vegans, Louisa and her family, but that is going to be in yet another interview post later on. For now let me just say we now have baobab powder, and the most amazing local herbal tea, which I am drinking as I write this. After the “police” incident in Harare we decided to drive away instead of staying the night. We got as far as Lake Chivero, and found a nice place called Kuimba Shiri which is also a bird sanctuary as well as a lodge and campsite. 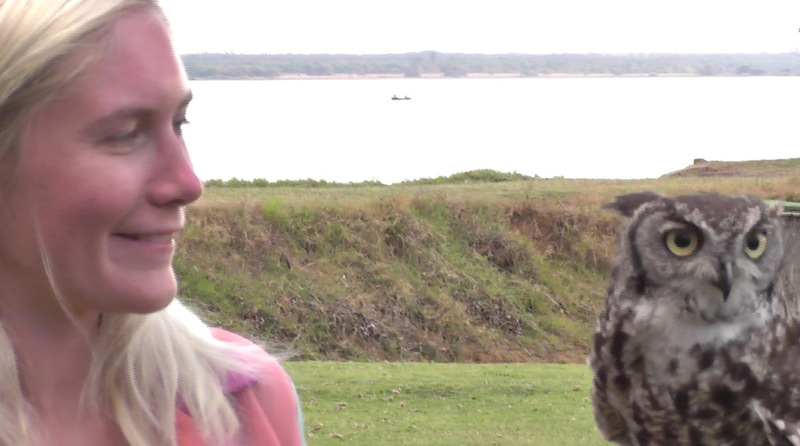 Unfortunately, they were experiencing a dramatic power cut, but the scenery was magnificent and we got to fly some owls! Barn owls are the cutest, I swear. 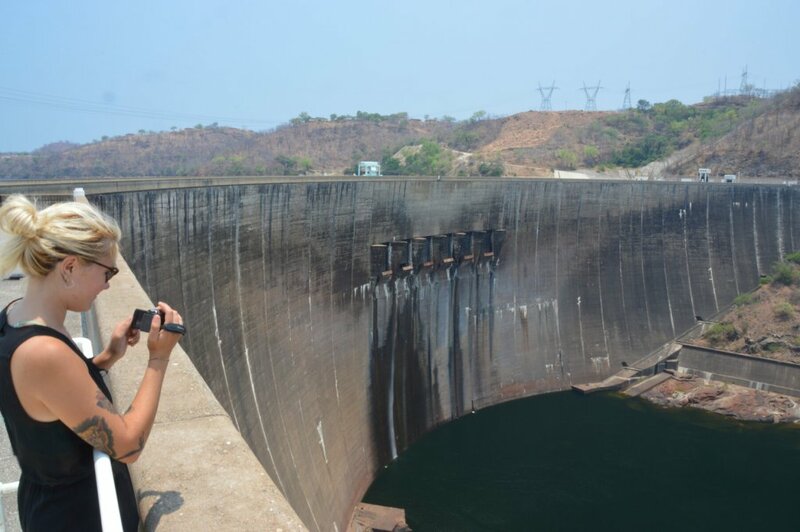 We were told the road from the lake to Victoria Falls, our way – was going to be bumpy and unpleasant. On the first day’s drive all was well – we passed some decrepit national parks, dry forests, dry rivers, small villages. It was clear that no foreigners pass through these parts – and even not so many Zimbabweans. We couldn’t find a single place to stay – no campsites, no lodges, no guesthouses, so we decided to try our luck at bush camping once more. We followed a small dirt track through the dry wiry forest for few kilometers, then turned onto another, even less used path, and finally came upon a little clearing overlooking a small valley, and decided to stop. We were spooked immensely – people say Zimbabwe is dangerous, not just the people but the wild animals – lions, wild dogs, snakes, elephants, who knows what else. We heard human activity down in the valley and tried to stay as quiet as possible, but had no trouble whatsoever. We rose with the sunrise and packed up, passing only one man on our way out to the main road. Soon after we encountered the bumpy dirt road, and it was really quite awful: potholes, corrugation, big inconspicuous holes, rough gravel, and so on. 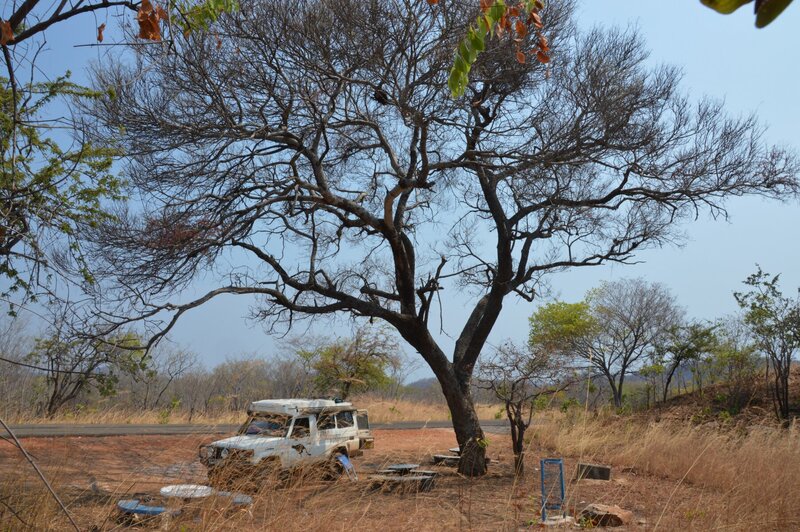 But eventually we found tarmac again, and proceeded to drive all the way to Victoria Falls. On the way there we encountered a few police road blocks, but the one that got us was because we apparently needed reflective white tape on our car – and had to pay a fine. It was infuriating that literally every road block was catching out the tourists for money. Thankfully we only had one thing wrong according to their rules, and rolled into Vic Falls annoyed but satisfied to have made it here. We booked a few activities right off the bat, rafting for the following morning and bungy jump and zipline for the next day after that. Later, we walked down to the tapas restaurant, where the food was quite delicious (enough vegan options too!) but at the end of the night the mood turned sour. To understand Vic Falls you have to view it as a complete African package holiday for many people who come here: you have your waterfalls and all the activities to do in the gorge and on the river, you have the national park with all the famous African animals, and you have other more uncomfortable things, such as the “African dances” being on offer every night everywhere. If we were in the bush and encountered a tribe, where a dance was going on, then that would be magnificent. But these were probably college kids, or just locals working a more “exotic” job than selling tourist souvenirs, clad in freshly laundered outfits, and the authenticity is quite spoiled by the women wearing obvious bras and coming up to the stage with backpacks. It was just a bit of a cheap touristy show and we didn’t care much for it. The worst though was an old man (“a fat old git” as Jonathan put it) who was clearly trying to secure one of the dancing girls for his table, and later perhaps for his bedroom as well. It was sickening the way he went about it, and it was sickening that the owner of the restaurant allowed this to go on, and even encouraged it, at least from where we were sitting it seemed that way. Profoundly disgusted, we went to bed. Now onto what happened today. 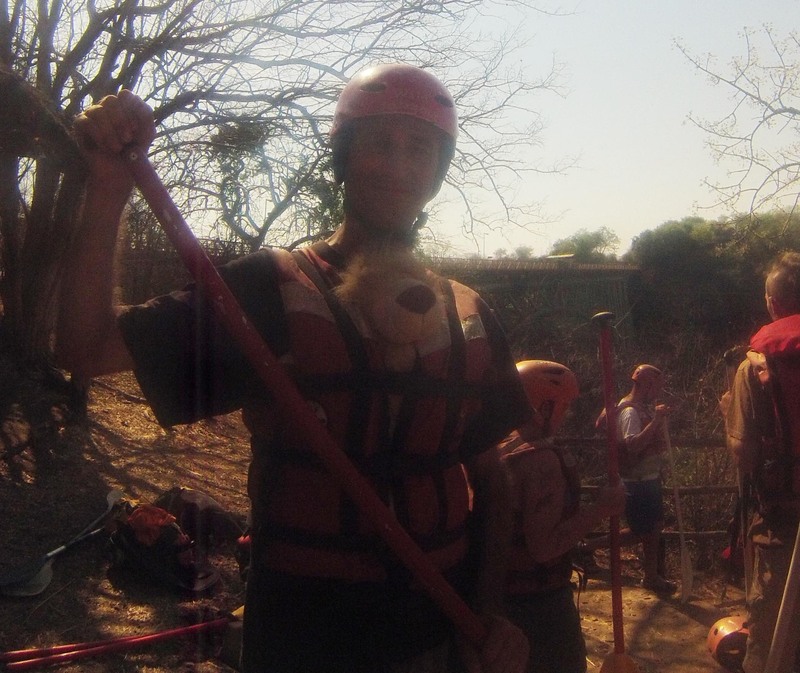 We got up bright and early to go rafting – I’d never been, wasn’t scared, and was really looking forward to it. Our path lay through 18 (I think?) rapids, some of them rapid V’s (aka very scary and forceful). We had a long meeting with all the other rafters and the guides, they explained the safety, the proper way to paddle, and so on. Finally we got on a truck-bus to the bridge, and from there descended for quite a long time into the gorge to the water. We had seven rafters in our group plus the guide. I sat in the back, Jonathan in the front, with someone in between us. Getting wet, paddling, shouting instructions, it was all great fun, until we came upon a very tricky twisty rapid, where the current either forces you into the narrow rocks, or hits you in the face with full power. What happened next I am not quite sure: I got thrown off the raft immediately as we met the first current, then I spent a fair amount underwater trying to get out but failing, swallowing a lot of the river in the process, and finally clearing the rapid and coming up to the surface, having difficulties breathing. I found my paddle, quickly grabbed it, and was rescued by another raft, with the main guide whose business name is Colgate. It was only after I climbed into the boat I realized my left leg was in a lot of pain. In fact, there was a bleeding gash on the knee with white stuff sticking out, and the ankle down to the toes was a shooting pain that made me think my foot was broken. They covered my wound as best they could using a first aid kit, but then the problem arose of how to get me back. The gorge is massive, and getting back up is only possible by walking – which I seemed unable to do at this point. Eventually everyone agreed that I should go through the next rapid with my original raft, and then I would be rescued by two guys, who would somehow miraculously take me up the cliffs to the car, and we would drive to a hospital. By the time we cleared the next rapid and I was stationed on the rocks, I lost it a little bit. I had a little sob and a few tears, I was in so much pain and didn’t understand how the hell I was going to climb up this gigantic cliff with a non-working leg. But I told myself to pull it together, and with the help of a few able-bodied men I was able to get to the car – most of the journey I was on the back of Brian, the poor young man had to sweat and struggle through a dangerous path of hot rocks and slippery soil with me hanging on for dear life. Not the easiest thing to do in the blazing 40 degree weather going uphill! I have the utmost respect for the guys who do these rescue missions. Out of everyone who helped me this day, I think to these guys I owe the most. When we got to the hospital, I was introduced to the funniest doctor I’ve ever met. He seemed so interested in the whole ordeal, like an overly eager intern at the hospital or something of that nature. He explained in detail, and (showed us the gory details inside the knee!) what was wrong with the knee – ruptured patella tendon, gaping hole through which you could see the inside of the knee completely, and a scraped kneecap. He stitched the tendon together, which was quite painful as he had to go digging inside the knee to find the loose end. Then he stitched the tissue, and finally the skin. I am going to have a lovely scar to remember this trip by! The worst is that I can’t really bend my knee, and I am not allowed physical activity for 6 weeks at least, which puts a few questions as to what we are going to do for the rest of the trip? Just drive everywhere, no walking or climbing for me? No swimming for sure… It’s all up in the air right now. I guess I was lucky to escape without further injury! Rafting is fun but I am never doing it again.